Obihai Technology, a leading manufacturer in the Voice over IP endpoint industry and maker of best-selling “OBi” universal voice adapters and IP Phones is pleased to have successfully completed interoperability testing of its Service Provider product lines with BroadSoft’s BroadWorks® platform. 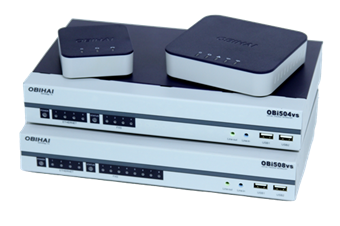 Service providers using BroadSoft’s platform will now be able to easily provision Obihai devices from within BroadWorks and use the OBi1000 Series IP phones with the full slate of BroadSoft’s powerful UC-One® Unified Communications solution. Completion of interoperability testing strengthens Obihai’s commitment to deliver BroadSoft BroadWorks integration across the product line. Now, all Obihai’s Service Provider products, including the OBi3 Series Universal VoIP Adapters, OBi5vs Series Universal Adapters for business and Obihai’s OBi1000 Series IP Phones benefit from comprehensive feature integration with BroadWorks. Leveraging BroadSoft's integrated provisioning platform ensures Service Providers can quickly qualify Obihai devices to their product line-up while engineering staff have a familiar interface to manage the Obihai product range.